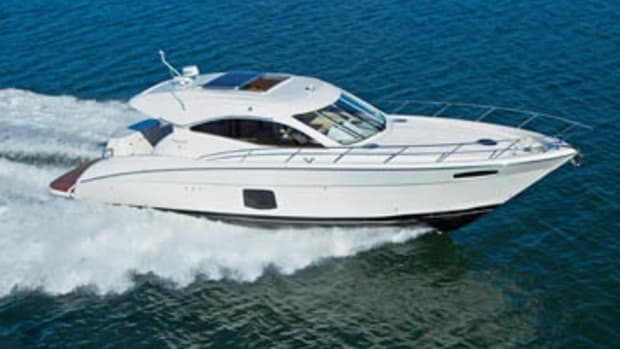 Our boat test of the Maritimo M64. 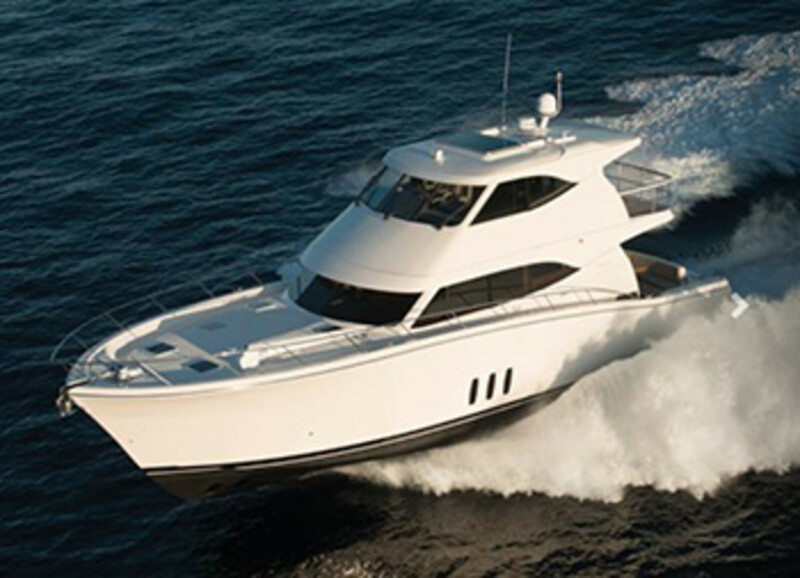 Boasting the best traits that Australian boatbuilding has to offer, the Maritimo M64 is a reflection of those who built her. To truly appreciate what makes a boat special, you need to understand the place where it’s built and the craftsmen who construct it. 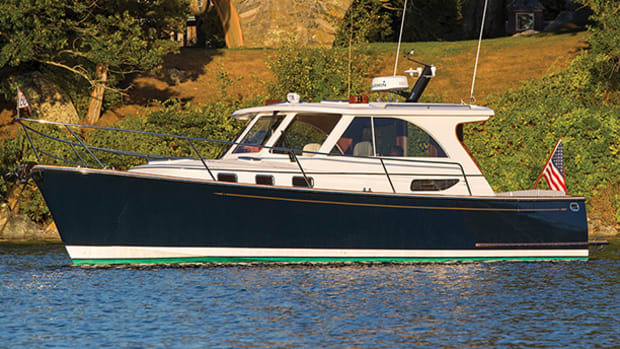 For example, spend a foggy morning in Maine, watching lobstermen pull their traps, and you’ll see the lines of a Down East yacht in a whole new light. 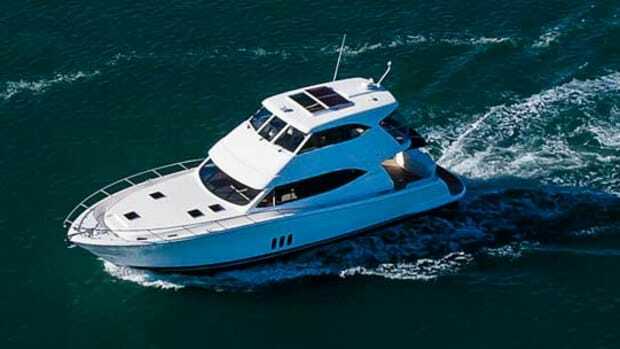 Push a sportfisherman to the pins at a Bimini start, and the reasoning behind oversized diesels makes more sense. It was that type of background that I sought to learn while in Australia, leading up to my scheduled test of the Maritimo M64. Before flying Down Under, I thought I had Australians pretty well pegged. I imagined a burly tribe of people fighting off venomous snakes and baby-snatching dingoes, breaking periodically to wash down a vegemite sandwich with a long swig from a frosty can of Foster’s. While he would not deny my dingo suspicion, just like that, my Hollywood-inflated understanding of Australia burst like a bubble. Sitting in a dimly lit bar with Roscoe and his son the night before our test—you know, conducting further research—he schooled me on all things Australian. He explained that Aussies possess a passion for being outdoors, whether that means running, swimming, surfing, fishing, or of course, boating. They’re a warm and inviting clan that’s quick to strike up a conversation and, perhaps more so than in most other countries, they value spending time with family. He would go on to explain that Aussies are also a shade (or 10) tougher than you’ll find on other continents. I nodded politely, not wanting him to feel the need to prove his theory, and called it a night. We reconvened the next afternoon aboard the M64, joined by several members of the Galati family, who deal Maritimos in the U.S. 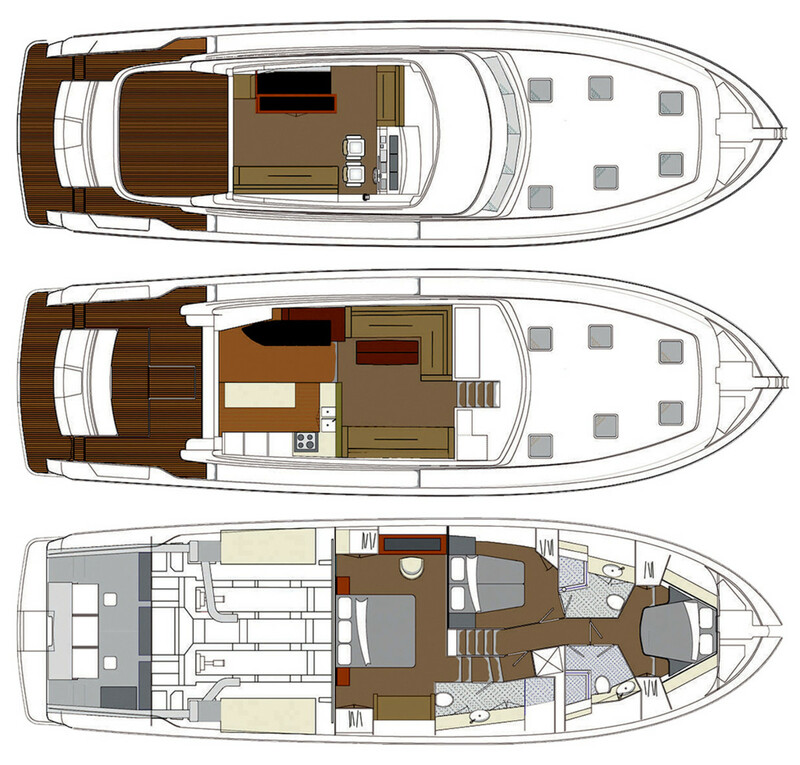 The Galatis spread out in the saloon and flybridge as Roscoe idled the boat out beyond the Broadwater to the Coral Sea. “For P.E. class we’d come out and surf these waters,” Roscoe said as he pointed to a choppy section of water just off the coast. “What are those buoys?” I asked. “That’s the shark netting,” he replied, in the same matter-of-fact tone that I would become accustomed to. I couldn’t help but think about how such an activity would go over in the U.S., a country where dodgeball has been all but eliminated from schools for being too dangerous. Maybe they do grow ’em a little tougher down here, I thought. Australian waters, like Roscoe’s countrymen, have a reputation for being just a bit tougher, too, what with 10-plus-foot seas being commonplace along the coast. On this particular afternoon, we saw relatively modest seas of 3 to 4 feet, with 25-knot zephyrs. Just as Roscoe throttled up to cruising speed (25 knots) and turned into the slop, a trio of fighter jets ripped across the sky. 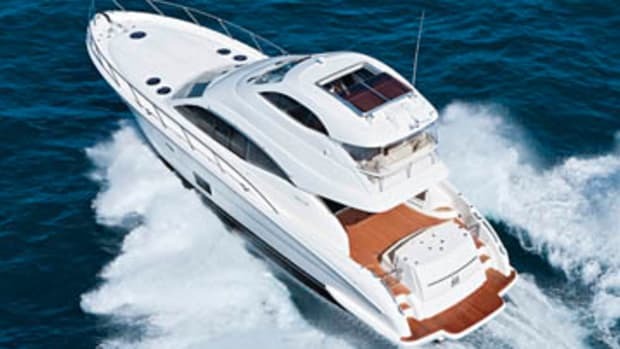 “Really, a fly over?” I joked to Maritimo’s Sales and Marketing Manager, Greg Haines. “We do what we can,” Haines laughed. 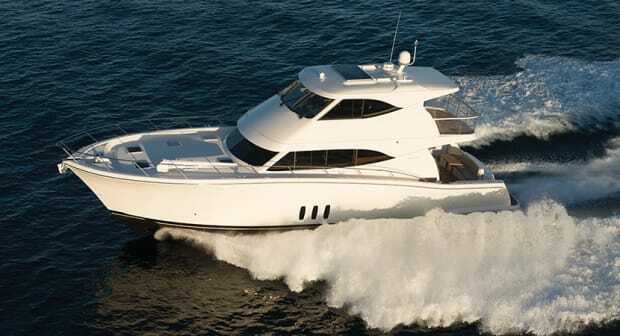 The churned-up Coral Sea was a fine proving ground to test the hull design of the M64, but it was the boat’s power plant—a pair of Swedish-built, 1,150-horsepower Scania diesels—that I was most curious about. 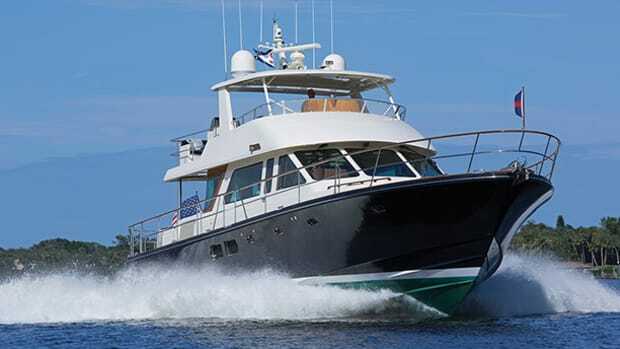 Scania is a popular engine used in large commercial vehicles Down Under, and is now finding its way aboard yachts (think John Deere getting its start back in the mid-’70s in the U.S.). Prying the helm from Roscoe, I spooled up the Scanias and discovered that some Aussie swagger had rubbed off on me. With the power of a football lineman and the grace of a ballerina, the 64 sliced through the waves. I swung the boat in tight turns at WOT, bouncing her hull against the short waves, and the boat never returned a single squeak, creak, or moan. 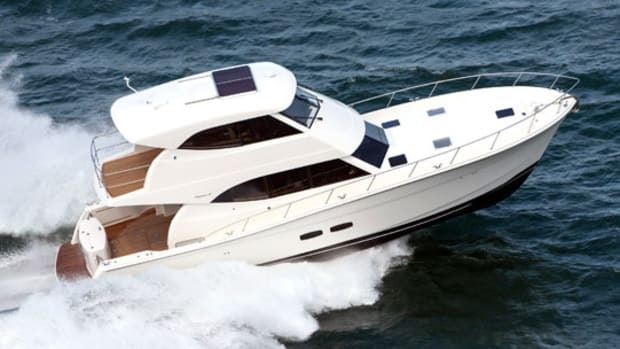 It was the kind of handling that bolsters your confidence to disproportionate levels (reminding me of those Holiday Inn Express commercials) and makes you feel like you’re one of the best boat drivers alive. It was gracious of Roscoe to only roll his eyes subtly when I suggested that he should recruit me for the Maritimo racing team. The engines have a lot to recommend them. They were relatively quiet, and pushed the boat to a respectable 32 knots. A close inspection of the engine room showed that they fit well within the belly of the 64; inspection points were easily accessed, and there was nearly 2 feet of space between engines. 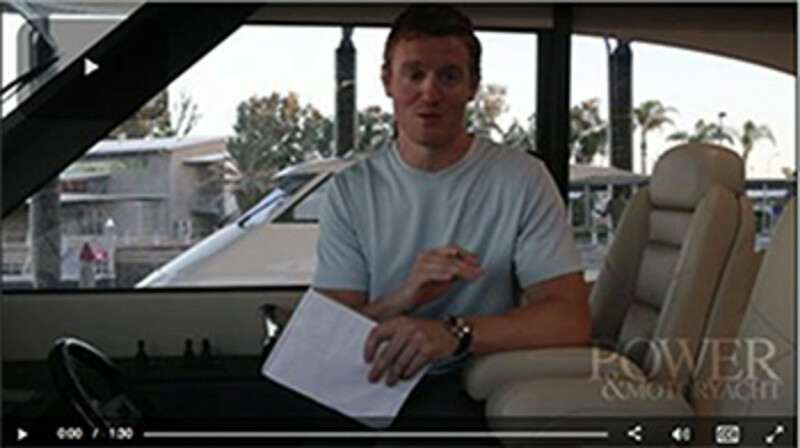 I eventually relinquished the helm to Roscoe in order to take sound readings throughout the boat. Walking down from the flybridge and feeling pretty good about myself, I half expected the Galati family to shower me in applause as I stepped into the saloon. 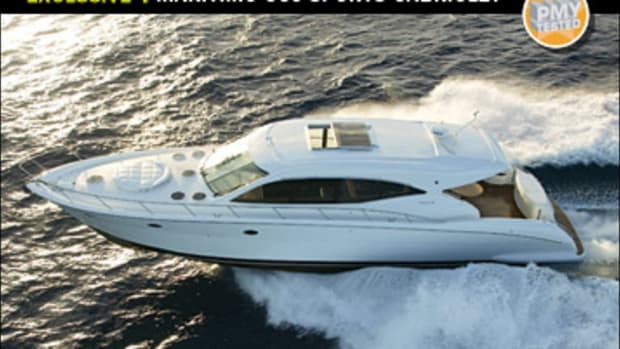 Unbeknownst to me, the ride had been smooth and quiet enough (84 decibels in the saloon, 86 in the master, and 83 in the VIP at 28 knots) that they seemed to have hardly noticed our at-sea acrobatics. No, instead they lounged throughout the boat. Some members of the family sat on the saloon sofas, swiping away at their phones and iPads, while others enjoyed the fresh air in the cockpit. Despite having 10 people aboard, no area felt crowded, a testament to the volume that Maritimo is able to create in the interior. Checking on the crew in the cockpit, I was surprised to see that, despite pummeling the seas like Muhammad Ali in his prime, this space was bone dry. Neither a drop of water nor a speck of salt had touched the deck. Stepping back inside, I followed the youngest Maritimo fan among the Galati clan, Jackson, who excitedly explored the three-stateroom, three-head configuration. I liked the spacing almost as much as he did. 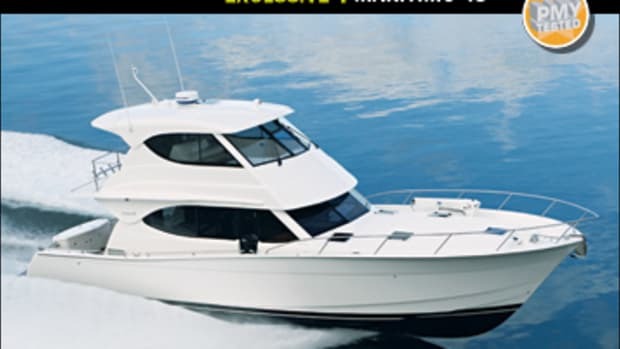 While the full-beam master is certainly in a class by itself, the amidships guest and forepeak VIP are comparable in terms of space and styling, and each has its own head, though the forepeak head functions as a dayhead, with a separate passageway entrance. Maritimo also offers a four-stateroom, two-head layout that, on paper, looks to be a well-thought-out option for larger families. All too soon we turned back toward the Broadwater; our test of the M64, and my time Down Under had come to an end. It was a whirlwind trip if ever there was one, but as I crammed myself into a god-forsaken middle seat of a jet bound for home, I was surprised by how big an impression the country, the boats, and the people had made on me. 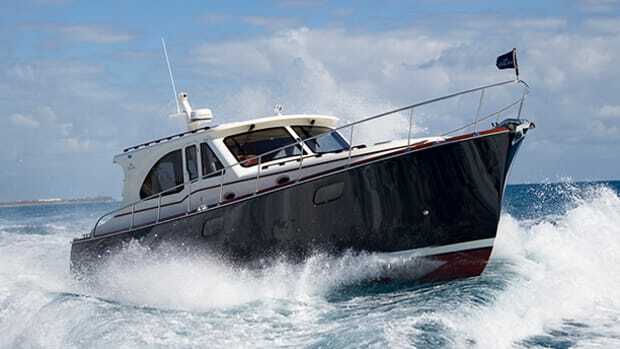 The Maritimo M64, much like a hard-nosed raceboat driver, represents Australia at its finest; both left an impression on me that will last a lifetime. 800 gal. fuel, 0 gal. water, 11 persons.